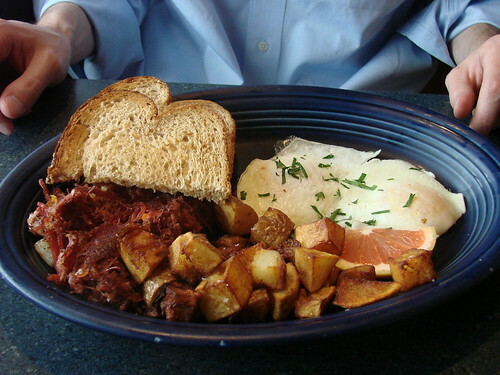 Bon Appetit called Hot Suppa's corned beef hash "Portland's best breakfast dish" so naturally Lawman had to give it a try. The corned beef itself was meaty and tasty--not too fatty, but while heavy on the beef, the hash itself was decidedly light on the potatoes. Fortunately Lawman ordered it with the side of home fries so he was able to get those meat and potato bites together. Delicious. I opted for the Biscuit and Sausage Gravy. The biscuit was tender and fluffy and seemed to have a hint of perhaps nutmeg that gave it more of a New England-y flavor than your typical breakfast biscuit. Never had a biscuit like that before, I might have to give it a shot myself. 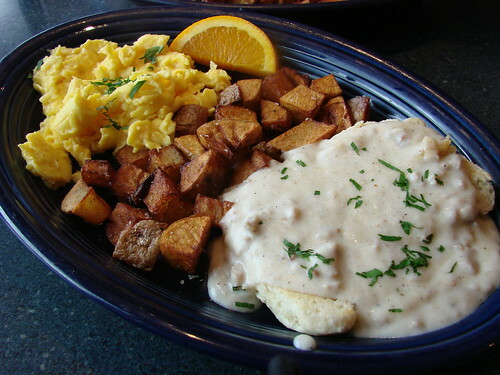 Top that with some rich sausage gravy and you have a most excellent breakfast. 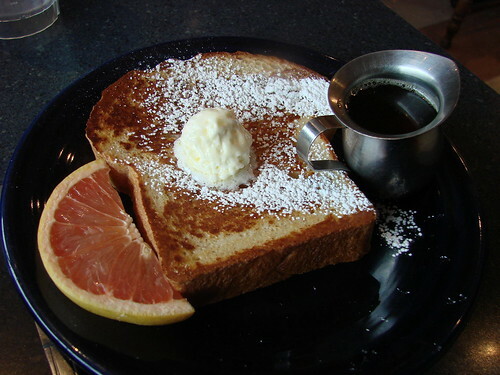 I couldn't resist the sound of their French toast so I went for a single slice on the side--you gotta love a place that will sell you just one slice of French toast. We arrived for a late lunch on a Friday and didn't have any wait, but I hear that on the weekends Hot Suppa can get wicked crowded. Next time I'm trying out their Fried Green Tomato BLT...mmmm BLT. Love your blog. LOVE Maine! And all the food that comes along with it. Portland has such great stuff. I had my first Organic Pizza with Seaweed (must say when I was 17 it wasn't too appetizing). Anyway, just dropping in!! Just had the corned beef hash a couple weeks ago and couldn't agree more. It should be called CORNED BEEF with a side of hash, or a sidette. A very happy plate for carnivores. The fried green 'matos are definitely worth a return!